Where do you think we get most of our electricity from? Depends on where you live, probably. Natural gas is big in a lot of the country. Big in 2016, probably bigger now. Coal plants are going away. We're stuck mostly with oil here but a garbage burning generator provides some. PV is big, of course. It has gone down since I've looked at it last! However, Natural Gas is a byproduct of an oil well, for the most part. So still stuck with fossil fuels. Thanks for correcting me on the coal part though. I think you will find coal has actually made a small advance the past two years. I don't think it's a great way to go in the long term, as even "clean" coal is environmentally unsound. Not really, natural gas is more often targeted separately than oil. But it is way cleaner than coal and better than oil. I think you will find coal has actually made a small advance the past two years. Incorrect. 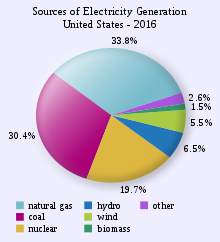 In 2018 coal provided 30% of electrical production and gas provided 39% (see above source). 1/3 of what comes out of an oil well here is Natural Gas.